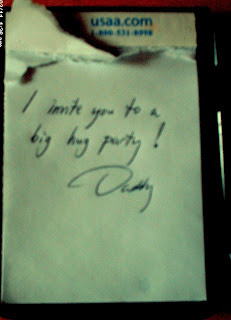 Josey woke up the other morning to a note left by Daddy on the kitchen table. I of course went into swoon mode for my hubby. Josey looked at the pad of paper and said, “can I take that paper off so I can draw.” Josey wanted the notepad — it was hers, after all! Parenting allows us to give a lovely type of nurturing drawn from that “outside of yourself” place. My hubby is not normally a “hugger” but he knows that Josey LOVES it. She has no idea what an effort it is for him. I got to thinking about this for myself. I am not one who really likes playing with toddler toys and only do it when Josey asks me to join in. However, I really enjoy reading children’s books and I really enjoy improvising crafts based on the stories we are reading. Maybe sometimes parents do not “play” as much as they would like because they feel restricted by the type of play that only taps into their kid’s place of whimsy. I submit that these could be opportunities to offer other playful options to our children which come in different and WONDERFUL packages. So here we go: PERMISSION TO HAVE FUN PLAYING! thaks for the reminder to play at the kids’ level of play, robin! I love this post! Thanks for including me! What a catch that hubby of yours is too! he is a good one Ashley! Congrats on your one year blog anniversary as well-EXCELLENT!